A very visible impact of climate change is being observed in the Karakorum region, where the glaciers are melting rapidly while GLOFs events occur with each passing year in the main three glaciers, located along the Karakorum Highway (KKH) in lower Gojal, Hunza Pakistan. A volume of water was running along the lateral moraine of the glacier and was creating glacial lake every year at Yaz Sam just above the Hussaini village in February when the glacial start melting and formed huge lake and latterly in busted out in June or early May and washed away the fruit trees and properties of two villages (Hussaini and Ghulkin) located on the end moraines of the glacier. Our elders were always suggesting to mobilize resource for it to bring out that water to the village to fulfil the shortage of water for irrigation. Through HOLD platform we did assessment of the area through help of GPS and mobilized fund from different sources and started digging at the site by our youth and community volunteers. The second major water project was brought from lateral moraine of the glacier, by cutting down the moraine for about 55 feet high 286 feet long. 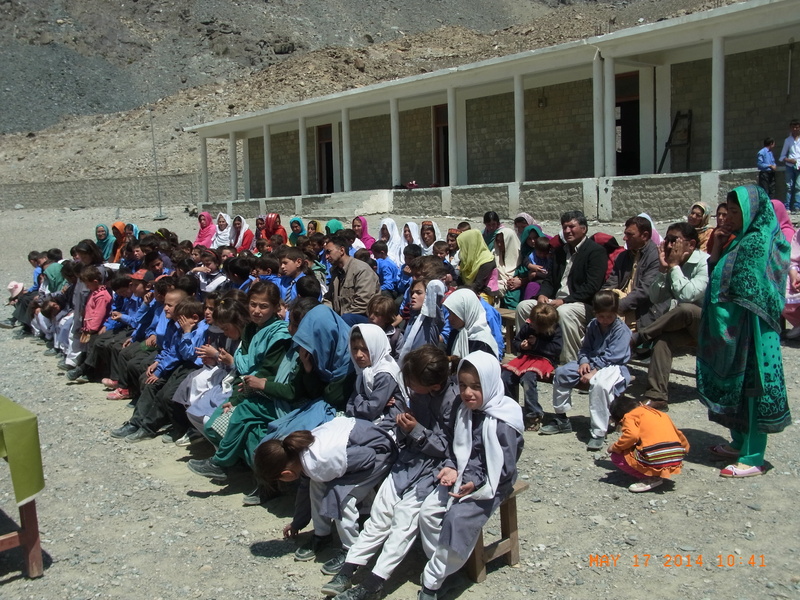 The project was supervised by the HOLD and funded by AKRSP, Government of Gilgit-Baltistan and Caritas International in collaboration of the local communities completed in 2011. Global Positioning System (GPS) tool was used for assessment of the project, which was carried out to measure the level of lateral moraine in 2009. The second project in which the moraine was cut down not only became a major source of water for the valley, it is also helping release the glacial lake as well as helps stop the glacial lake formation and outburst at the same location. A first ever community initiated project in the entire region or even in Pakistan which has solved the water shortage in the village but as well as stopped the glacial lake formation and outburst at the same location. Our role as a volunteer during the above mentioned projects was to carry out assessment, monitoring, resources mobilization, reporting and over-viewing the entire process of the projects. Though both are temporary solutions due the environmental and climate change challenges but these projects are yet very successful and it brought out the communities from drought situation. A Complete documentary on Climate Change Impacts; Water for Irrigation, Situation before and after the Community initiatives with the help of GPS in 2004 and 2010. Hardship to get water, situation before the project. How people were working hard on glacier to get water for irrigation (farmer’s interviews). There was a disastrous situation in Hussaini village due the glacier advancement for the last many decades, resulting in much suffering of the local community Both for drinking and irrigation water, the people of Hussaini ware working on the glacier 8 to 12 hours on daily basis for many years now. A glacier is located in the west and the Khunzhrav River is flowing to the East of the village but due to lack of resources there is no water in the village. A drought like situation hovers on the village for many years. As the glacier is advancing very fast toward the Khnzhrav River and KKH – located at a distance of some 254 meters, the four channels dug out from the snout of the glacier have been destroyed and now the temporary solution was obtaining insufficient water through a pipeline from the southern glacier’s originated stream to the northern snout of the glacier. The project was initially designed to place in a stream in a glacier originated stream in the neighboring village at an high altitude where the area was very vulnerable due to slop instability and rock fall and the project failed before the completion of the work due to some other reasons too, but when we surveyed an another source, the stream originated from the glacier in our village and the village channels with the help of Global Positioning System (GPS) it shows us an hope that the water can be discharge into the channels and the young people from the community worked voluntarily to implement the project and we succeeded in the pilot in 2004 and another 2 pipelines were placed at the same source in 2005 which is irrigating the entire Hussaini village through three channels. A drought situation was prevailing in the village before the implementation of the project. 65% of the household are depending on agriculture and potato is the only cash crop of the area to support their children’s education and other needs. The glacier is advancing and moving toward the Karakoram highway and destroys the sedimentation tanks and pipelines. One of three pipeline was also washed away by the recent GLOF and next GLOF can be happen anytime. The community repairs the water tanks every year and two volunteers are deployed there to maintain the water supply daily in irrigation season from March to mid-September. 3 million funds from the Government of Pakistan for the pipeline and the worth of more than 3 million of voluntarily work has been done by our youth and community that was supervised by the “Village Council” a community based project committee under the umbrella organization in 2005 and 2005. Voluntary maintenance of the project since the construction of the project is continued to date. 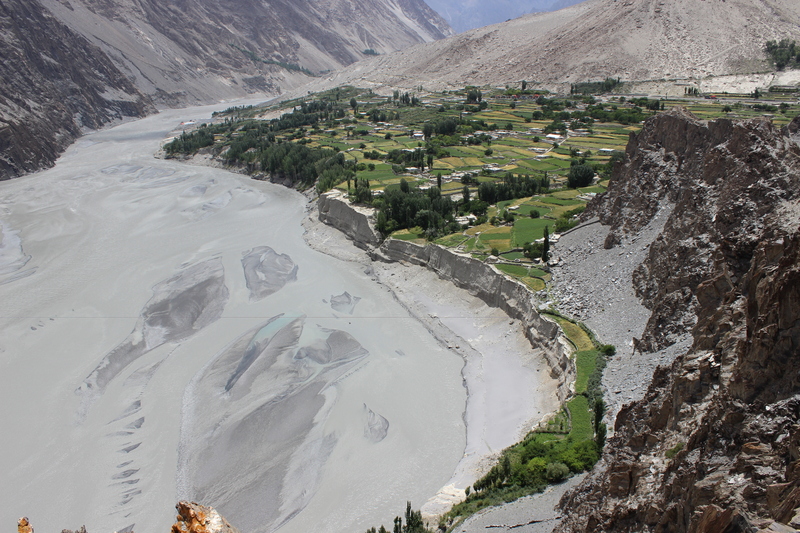 Hussaini Organization for Local Development (HOLD), a community based organization working in the Gojal Hunza in Northern Pakistan, successfully resolved a decade’s long water crisis in the Gojal Valley by utilizing the available limited resources. So far the organization has successfully executed two major water projects both for irrigation and drinking purpose. The residents of this village have lost several lives while many others are disabled during struggles for water on different glaciers in the valley. The first mega water project was for irrigation purpose, which was brought from the southern snout of the glacier to the northern snout through pipe lines by connecting it with water channels. The project was successfully completed in 2004, in collaboration with the Aga Khan Rural Support Organization (AKRSP) and the community based organizations working in the region. A documentary on the pipeline from South to North. One elected government completed its tenure while another soon to resume the office but the decades long miseries of the dwellers of Hussaini village remained unheard. Hussaini, a village in Gojal valley, 45 kms from Central Hunza and 132 kms from Gilgit, is one of the most unfortunate villages of Gilgit-Baltistan which is deprived of the very basic facilitates of life in this modern age. The people of this village face plenty of problems ranging from water shortage, both irrigation and drinking to education, health, infrastructure and almost a 30 years long bridges dilemma, which connects the village with its other part, known as Zarabad (three times larger than Hussaini), parted by the Khunjrav River. The people of Hussaini are mostly dependent on farming, as they practice all agricultural activities in Zarabad for a long time. In the winter season the locals of Hussaini construct temporary bridges to make access to Zarabad but in the summers due to huge flow in the Khunjrav River, wipes off the only source of connection between the two villages. People can’t go on daily basis to Zarabad for farming or any other purpose in the summers. In order to sustain the only source of income (farming) the locals select five farmers every year respectively to take care of the crops of the entire village, who move to Zarabad for the entire summers. In recognition of its tourist, hunting and agricultural importance in 1960 then President of Pakistan Ayub Khan, who visited Zarabad for hunting purpose recommended for construction of a suspension bridge between the two villages. Which was finally completed in 1967-68 by the government. While the AKRSP constructed a hanging bridge at the same location in 1986, which was demolished by the severe wind, which flows in the valley in winter season. Ghzanfar Ali Khan elected five times as representative of the area and on every election he promised the people for construction of bridge and even sometimes he claimed to construct steal or RCC bridge for two villages, Zarabad of Hussaini and Kharambad of Passu. Both are located across the river. Ghazanfar Ali Khan, who was Chief Executive during the Musharraf regime, and is now newly elected member of Gilgit-Baltistan Legislative Assembly from the constituency was invited in the village in 2006 over this bridge issue and he said Zarabad is sort of a pasture and we cannot spend much amount of money on it. Before that he had promised to the people of Hussaini several times during his election campaigns that he will resolve the two longstanding and notorious issues bridge and drinking water problem of the village. But his tall promises never fall true. PPP got elected three times from the area but they also ignored the problem despite several promises. The broken bridge was completed submerge in Attabad Lake in 2010 following the Attabad landslide disaster. Though the PPP led government rehabilitated the bridge. But due lake of check and balance by the government the contractors rebuilt the bridge with poor quality material which has again started worsening. The Passu village is also suffering from the same problem due to lake of bridge between Passu and Khurambad. The ground realities and situation can better be seen in the video report. The Glacial Lake Outburst Floods GLOFs and glacier originated stream from Hussaini Glacier (Sisuni Yaz) which has changed its permanent course due to so many GOLF events has been washed away thousands of popular trees, properties of around 30 household and the main irrigation pipelines (600 feet/6 inches) to the village this year from May to September at Yazyopk and main Karakoram Highway was blocked for four months. Almost 70% area of Hussaini village is depending on these pipelines. A drought situation can be prevail in the village if the irrigation pipelines are not restored on time. Local community has requested GBDMA to compensate the public losses. According to the folklore, Hussaini was a big village of Gojal, but unfortunately Shimshal flood eroded it many times in early 1960s. It is said that the distance between Hussaini and Zarabod was very close, people used to throw stone to Zarabod by their left hands (about 200 feet), but now, according to a field survey the distance between these two villages (Hussaini & Zarabod) is 1 kilometer. Shimshal flood occurred periodically every twenty years, the last flood, which was very disastrous, came in 1960 and continued up-to 1963. This flood happened as a result of glacial hazard. Two glaciers merged Khurdopin and Yazghel with each other and blocked the stream of other glacier (Verzrav), which made a big dam and when it was opened, it eroded a large area of Passu, Hussaini, and Gulmit. 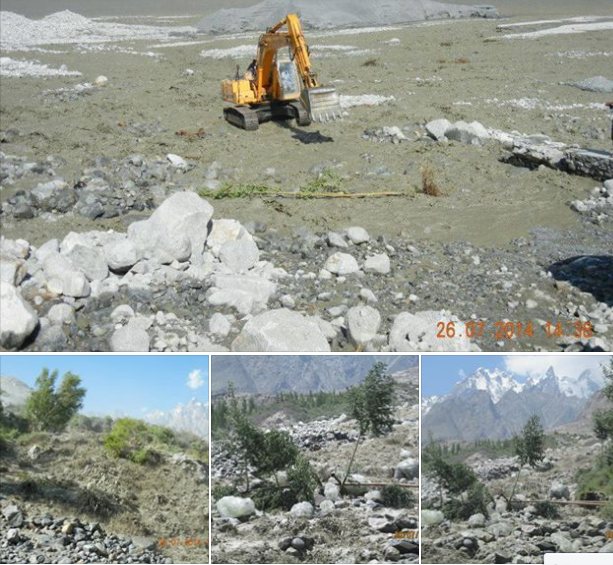 Since the last 6 years, Glacial Lake Outburst Floods (GLOFs) have been posing a serious threat to a number of villages in Gojal Valley besides damaging the Karakoram Highway (KKH) N35 and the bridges constructed on the highway near villages Hussaini and Ghulkin. The frequency of GLOFs at the site has increased over the last 2 years. Gilgit-Baltistan is surrounded by gigantic mountains and glaciers and the glacier water always poses threat to the inhabitants. Many times the GLOF has destroyed the infrastructure and in particular the road access to the lower part of the province. 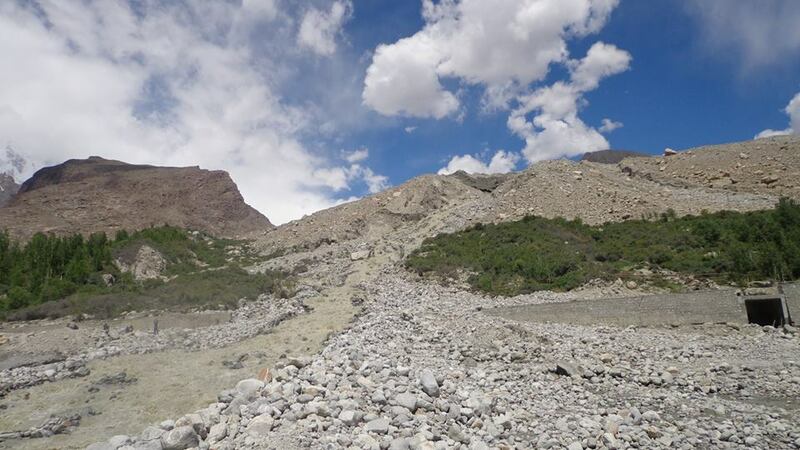 A glacier situated between Ghulkin and Hussain villages is the most dangerous GLOF site which poses threat to both the villages as well as destroyed the KKH due to which the people travelling through the area face serious difficulties. It is worst in case of emergencies. Likewise another glacier which lies between Gulmit and Ghulkin is a serious threat for both villages. Many times the water has changed its flow towards the village and the villagers have take measures to divert the flow at its original position. On May 25, 2014, an enormous GLOF caused havoc on the Northern side of the main bridge located at the site whereby the KKH, two bridges besides several culverts were inundated. The incident left commuters and locals of the area stranded on both sides of the flooded highway. No immediate response was taken by authorities; however, five days after the incident, authorities cleared the site and traffic resumed across the flooded highway. Officials of the National Highway Authority (NHA) and China Road and Bridge Construction Corporation (CRBC) eventually made an alternative way for vehicles to cross the GLOF site. On June 14, 2014, another massive GLOF hit the KKH on the Southern side of the main bridge located at the site, inundating three culverts and consequently blocking the highway. The voluble water utterly demolished the KKH. Yet again, relevant authorities failed to initiate any prompt measure to resume transportation on the KKH. Hundreds of passengers were left stranded on both sides of the blocked highway. However, local volunteers and boy scouts were seen making way for the passengers to pass the blockade. As this report is being posted, the highway remains severely damaged and flooded, bringing traffic to a standstill on the KKH. This has not only affected lives of people of the area, but also businessmen, tourists and travelers. Passengers, specifically vulnerable groups like the ailing, the elderly, women and children are most at risk. People are crossing the flood by foot and it is feared that any casualty resulting from the incident will compel locals of the area to point fingers to government authorities. On condition that historic records have been on hand, facts have been showing that glaciers and glacial lakes have been a hazard to highways, bridges, people and property located downstream. Glacial Lake Outburst Floods (GLOFs) occur when glaciers condense and move forward and, in many instances, block side valleys causing river and meltwater to build up against an ice barrier. In some instances, as these glacial lakes grew, increasing hydrostatic pressure eventually causes the ice dam to lift or burst, resulting in heavy flooding towards downstream areas where it wreaks havoc by damaging highways, bridges and properties. GLOFs and the resulting blockage of the KKH at the site between Hussaini and Ghulking villages in Gojal Valley are not new. Since the KKH has been constructed just over the Hussaini glacier, flooding has been witnesses at the site during the last 6 years. Local experts say that the last 2 GLOFs were comparatively powerful and damaging to public infrastructure and properties. Moreover, discharge of water from the glacier near Ghulkin village has also prompted fear among the community. According to experts, unlike the previous flooding that took place in summer, extreme water flow was also noted in the winter of 2013 when the temperature remains in the negative. According to FOCUS Humanitarian Assistance, the water in a lake formed on the Hussaini glacier has also increased to an alarming level. This could become a potential threat to the KKH, and bridges and culverts on the KKH in future. The GLOFs have damaged about two kilometers of the KKH so far. The blockage of KKH has left hundreds of tourists, businessmen and travelers without any alternative route, forcing them to cancel their plans. This has adversely affected the local economy. It is pertinent to note that a majority of the local population of Gojal Valley is reliant on tourism for their income. The KKH serves as the only land route between China and Pakistan and accounts for trade worth billions of rupees. Blockage of the KKH has had adverse impact over the trade between the two countries and businessmen have started rethinking their plans to carry their goods via the KKH. The local community of Gojal Valley in general and residents of Ghulkin and Hussaini villages in particular have been suffering as a result of the blockage of the KKH and inaction on part of relevant authorities. Besides creating problems for local commuters, the KKH’s blockage has negatively affected the local economy. On June 18, 2014, officials of the NHA visited the flood site after locals threatened to go on strike if immediate action is not taken to contain the situation. The NHA team was led by the General Manager for N35. The authorities took notice of the situation on ground besides meeting with the local population and taking note of their concerns. GM NHA assured the people that he would initiate immediate measure to provide them relief and resume traffic on the KKH. Authorities have yet to initiate measures for transportation of patients, women, children and the elderly across the KKH which is still under flooding. Local volunteers and community members are currently helping people cross the gushing water. It is worth mentioning here that thousands of people travel on the KKH each day. Crossing the affected site to go to Pak-China border and vice versa has made life risky for travelers. Since the China Road and Bridge Corporation (CRBC) is responsible for improvement of the KKH in the area, the company has yet to initiate damage repairs. CRBC has been progressively repairing the damage caused by the floods and the progress to date, including bridge replacements, has exceeded millions of rupees. However, the repairs can’t withstand the powerful floods with gushing water and boulders. Regarding this problem the people of Gulmit took precautionary actions to build a safety wall on the edge of the flowing glacier water. This proposal was accepted by the FOCUS Humanitarian Assistance Pakistan and approved a grant for the building of the safety wall. This project is in progress under the supervision of Gulmit Organization for Local Development (GOLD) from March 2014. Digging of the foundation, which is 2km long, 5ft wide and 4ft deep, was done by the villagers on voluntary basis. The project has now been contracted out. The wall is still under construction and will be 10ft high. 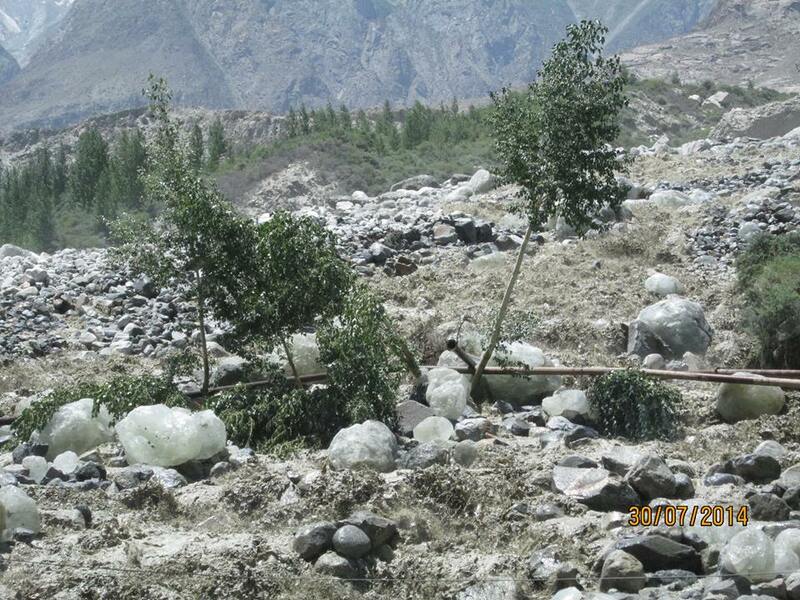 Glacier a Contentious Risk to the Local Community and KKH. Hussaini; Though glaciers have a great roll in human civilization in terms of agriculture an power generation, at the same time glacier areas have so many hazards for the local population. a recent example is Hussaini glacier, which has washed away the Karakoram highway (KKH) making travelers life measurable and its another disaster for the people of Gojal valley after Attabad. Glacier originated stream that has changed its course due the GLOF events and has been disturbed the life of the people of Gojal for last two months at YazYopk, Hussaini Gojal, government has no concern with the suffering mountain communities already in Attabad disaster since Jan 2010. 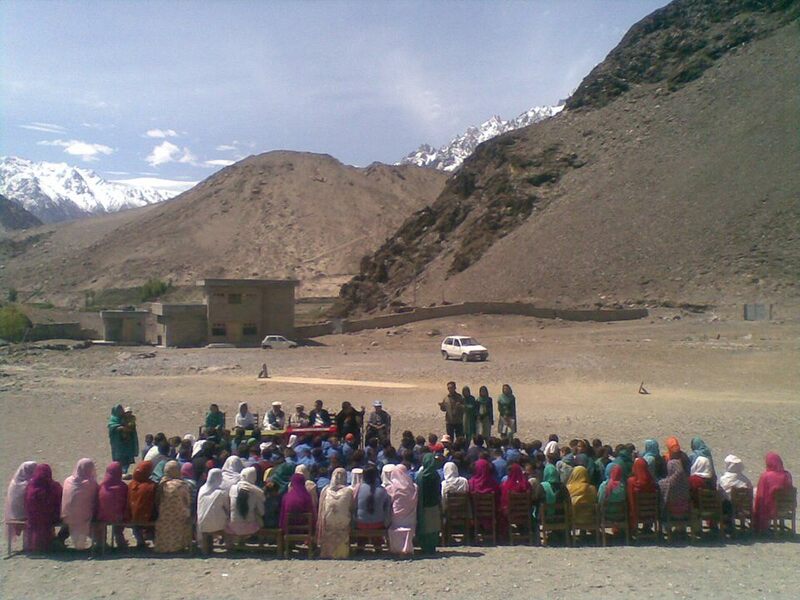 The students of Government Primary and Community Based School (CBS) have celebrated Environment Day on 5th June 2014 in Hussain i Gojal located on the moin Karakoram Highway (KKH). 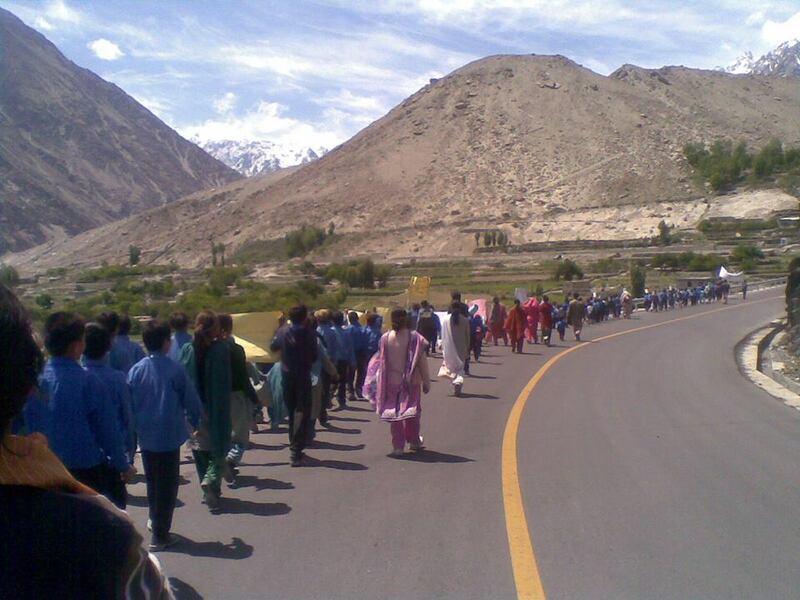 A walk arranged from the school to the village center to raise awareness among the communities. Scouts and Girls Guides also conducted a full day session for the community on environmental issues. Repairing work of Hussaini suspension bridge is in progress, Mr. Rehmat karim and the team of volunteers are assisting two contractors in both projects of Zarabad Water drinking project and rehabilitation of Hussaini suspension bridge. Boys Primary school has been shifted to the new building at Xzoyee-bogh, Sholmol under the leadership of Chairman, Education committee, Mr. Sher Wali and HOLD. The Deputy Director Education notified and ordered to the school management and ADI Gulmit for immediate action based on the demand of Hussaini community condition all after the written evidence received from CBES, Numberdar, SMC and HOLD for PWD and DDE to complete the remaining works that was considered obstacles for up-gradation to PC-4. Aim of shifting these classes was to accommodate the increasing number of students in separate classrooms, enroll the CBS students in government school, HOLD and education committee representatives will be in close coordination with the government education department for up the gradation, immediate taking and handing over process for PC-4. The volunteers of Hussaini and Khushhali Committee agreed to undertake the task before the deadline given from these two government departments. CBES and government primary school shifted class 2 to 5 to the government middle school building, though class 6 to 10 (CBS) is shifted to AKES (community building). While ECD, Prep and Class One will remain in the primary building. 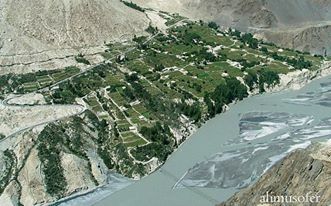 Hussaini Organization for Local Development (HOLD) was established in October 1996, as a non-profitable organization, aimed at conserving the natural environment, capacity building and sustainable development in social and cultural sectors of the Hussaini valley, located in Hunza valley, Gilgit-Baltistan region of Pakistan.